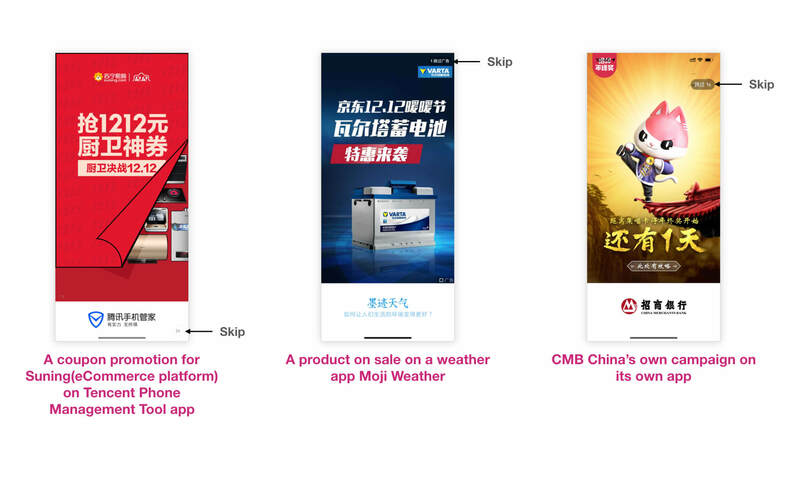 Chinese popular apps have a common design pattern: show full screen, visually attracting ads during app startup. The pattern is usually called splash screen Ads by product managers and designers here. Mainly used for brand marketing and campaigns. These Ads usually stay for 3 - 5 seconds and disappear automatically. Or user can skip it by tapping the skip button. A slightly different pattern is modal Ads. It pops out right after user opens the app and enters the homepage. For this, user is force to make a decision: tap on it to view details or close it. Both patterns block users from using the app. Quite intrusive. For a long time, I can’t figure out why people do this from a design perspective. Shouldn’t we let the users in as fast as we can? Why can we should these ads later, or even embed ads into content. Actually many western products do this such as Twitter and Facebook. Until I saw this talk from Connie Chan at a16z Summit. On a small screen, display ads have limited space to display. On a small screen, people have lower tolerance about ads, especially while they’re in the middle of accomplishing something with the app. 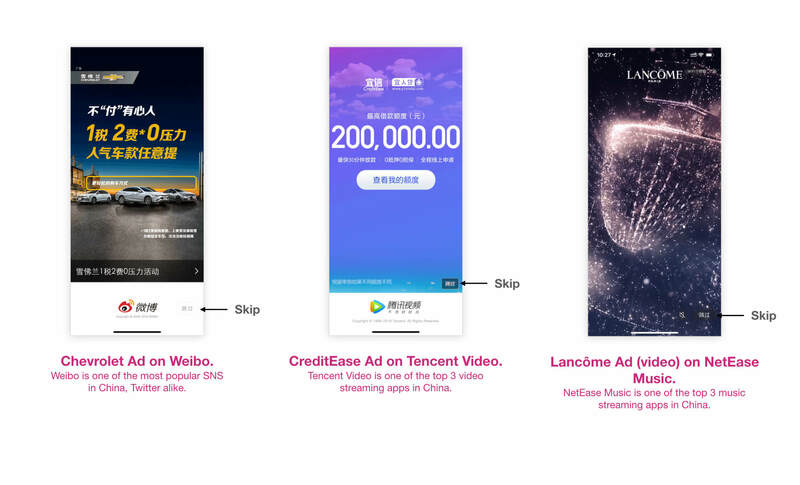 Western apps choose to melt ads INTO content itself, especially in content heavy or feed-centered apps. Ads are designed almost the same as real content to make them less intrusive. 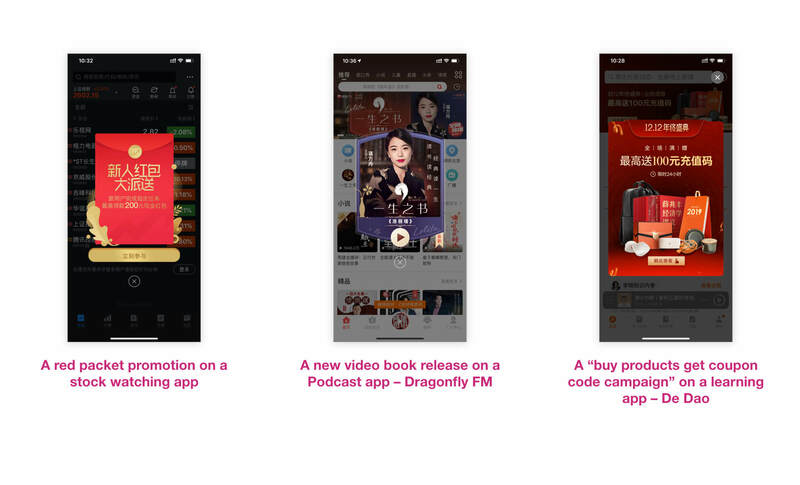 Chinese apps choose to intentionally leave them OUTSIDE of the content. To put it another way, these apps aggressively find other Ad slots which are both bigger in size (full screen) and impossible to ignore. (Think about TV commercials before our favorite TV show starts.) In return, these apps try not to show lots of ads inside content. I used to hate these Ads a lot. Recently I started to pay attention to them and do tap on them occasionally. Maybe these apps learned my behavior and started to show more relevant Ads. Maybe the designs got more effective on luring users to tap. Maybe they’re not that bad after all.